Learning the basic principles of western music construction and design is easy when presented in a semi-academic format. This type of presentation reveals the foundational aspects of vertical note reading, and applications in rhythmic and practice. One of the most difficult aspects of teaching western music is supplying students with helpful and constructive take-home materials that reinforce solid music ideas. 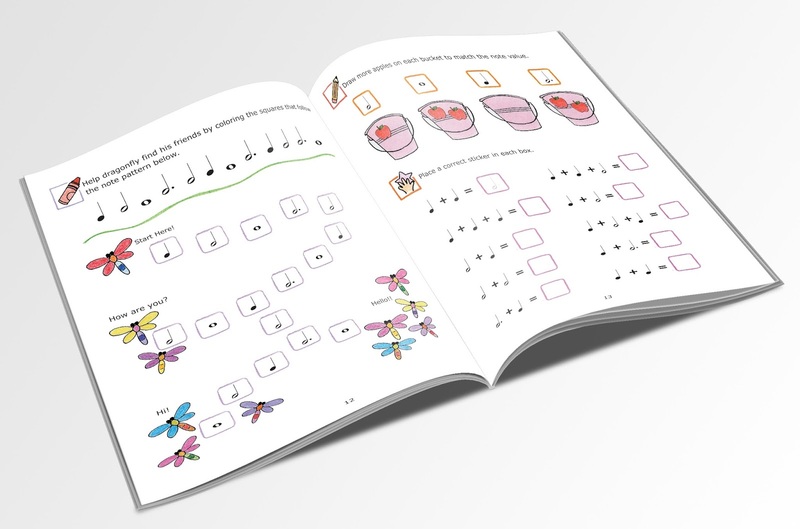 Workbooks are a great way to convey concepts learned during lessons, while providing challenging problems that lead to greater musical understanding. Introducing and applying the symbology and performance standards in western music is key to a well-rounded study experience. If a music teacher can convey the mathematic and historic basis of music to students, more success in understanding how music is organized will take place. This workbook series is arranged in a way that logically and cumulatively exposes new music students to note reading and rhythmic-oriented skills that are essential in exploring western music. Individual assignments in note recognition, rhythm accuracy, and instrument techniques are included in step-by-step self-directed assignments and exercises. Many people do not have the time to enroll in traditional instrument and general music lessons, but have a need for knowing what western music entails. Using a self-directed mode of learning, students can utilize music theory and practice workbooks to gain a quick understanding of the way music is constructed. This type of academic music instruction is especially helpful for musicians and laypeople who come from non-western backgrounds and sensibilities. People who choose to use music workbooks to learn about the fundamentals of western music construction, composition, performance, and practice will experience a fun, yet intense type of study. Exercises and assignments provided by workbooks demand close attention paid to concepts involving mathematic, aural, and spacial concepts. A deep understanding of meter, symbol recognition, keyboard application, and general music theory is imbued as a student progresses throughout the workbook chapters and courses. Using western music theory and practice workbooks is a way for people trained in other music systems to gain an understanding of the most common and universal music concepts used throughout the world. Western music is unique in the way it treats acoustics and individual instrument performance, but also borrows from other world music systems. Utilizing well-organized and informative workbooks is a great way for any person to master the art of playing and reading western music genres and styles. Learning the basic principles of western music construction and design is easy when presented in a semi-academic format.